But often, if you know where and how to search, the answers can be found without an excess of work. This week's Challenge is an example of exactly this idea. If you spend more than 5 minutes on this Challenge, you should stop and think to yourself: How else can I solve this Challenge? Once you figure out the method, you'll see why I've posted this particular Challenge, and you'll have yet another arrow in your quiver of SearchResearch skills. Here you go. When you figure these out, please post your answers in the Comments. Be sure to say HOW you found the answers. As I said, this really is a 5 minute Challenge. 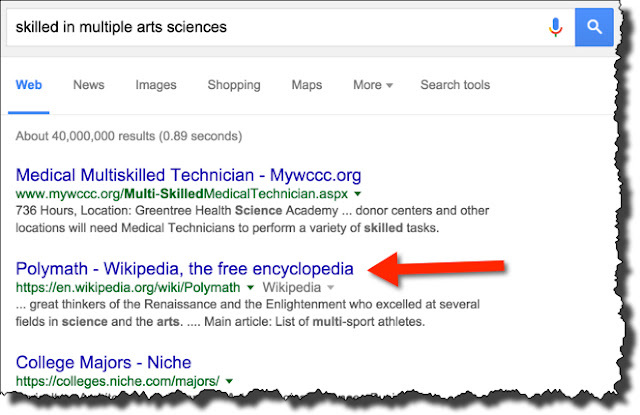 Do you know a method to make your searches that quick and effective for this kinds of data collection / comparison? This past week I was in the western Caribbean, on the island of Bonaire (part of the Netherland Antilles), and I'm seeing a bunch of extremely interesting animals. What can you dig up on these? So... what did you find out? Some fishes identified there are Parrotfish, Honeycomb, Spotted Moray, Porcupine fish. Luis writes: Blue parrotfish. Scarus coeruleus. From FishBase: "reports of ciguatera poisoning" (meaning: don't eat it; "ciguatera is a foodborne illness caused by eating certain reef fish whose flesh is contaminated with a toxin made by dinoflagellates such as Gambierdiscus toxicus which live in tropical and subtropical waters.") 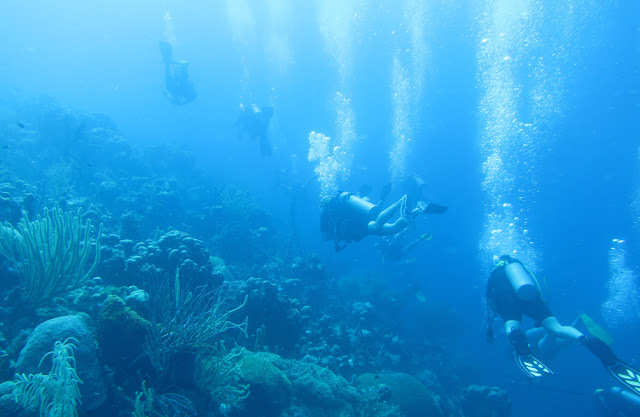 All results that are relevant point to Florent's Guide To The Florida, Bahamas & Caribbean Reefs, part of Florent's Guide To The Tropical Reefs. For this image, Luis did a nice Image search: ("Blue shrimp and anemone") (found initially through an Image Search of an image crop). 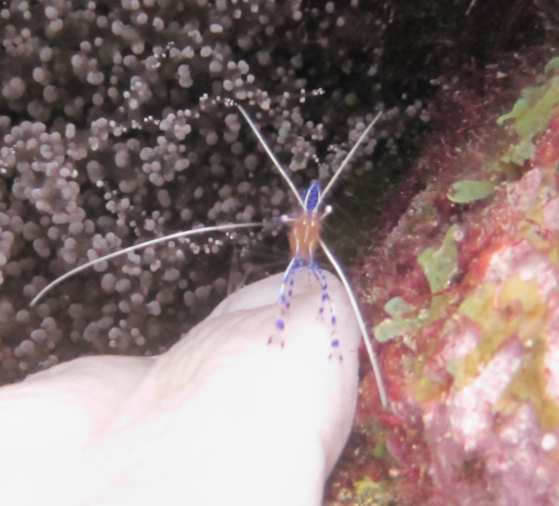 This is a Pederson's shrimp (a species of Cleaner shrimp). Ancylomenes pedersoni. 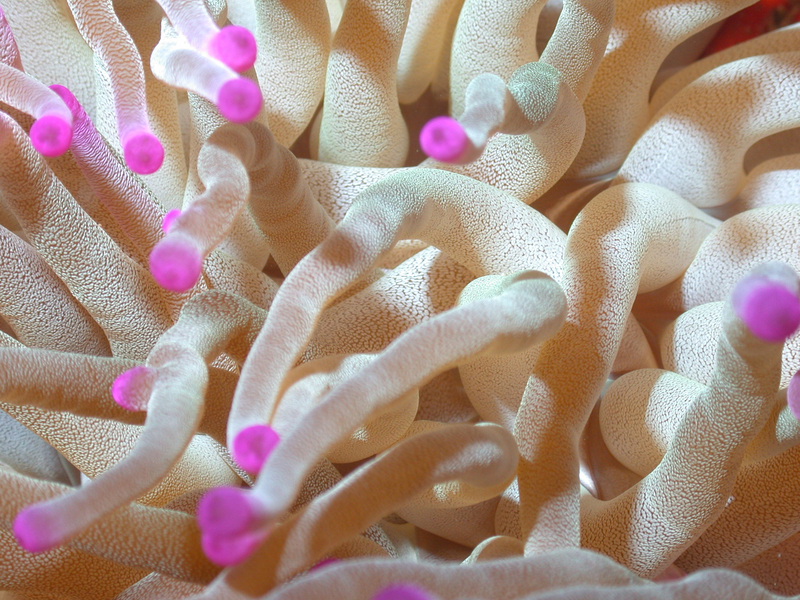 From the Marine Species Identification Portal: "lives in association with a variety of sea anemones, Lebrunia danae, Bartholomea lucida, Bartholomea annulata and Condylactis gigantea" (the last one seems to be the anemone on the photo); "When approached carefully with an extended hand, it may come out of its protection to clean it." Nice and funny info on how they clean fish on the Wikipedia article. Here, Luis writes: There are over 10,000 species of bristle worms (aka polychaetes), divided into >80 families. Because "each of the over 80 families living today have characteristic body shapes and chaetal types" (WoRMS), I guess it's safe to say that the species on the photo is a fireworm — ie, belongs to the Amphinomidae family (found similar creatures though Search by Image). I just downsized the sample of electable species to less than 300 (check here and click on "List Species"). 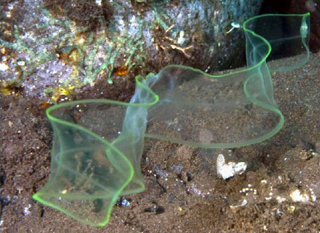 One of the most common, and to a layman very similar to the one on the photo, is Hermodice carunculata. Another common one is Eurythoe complanata. 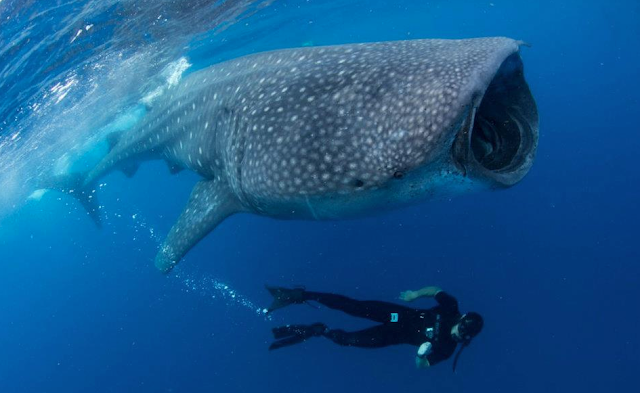 Very interesting facts on this Advanced Aquarist article. Luis writes here: Honeycomb cowfish. Acanthostracion polygonius. 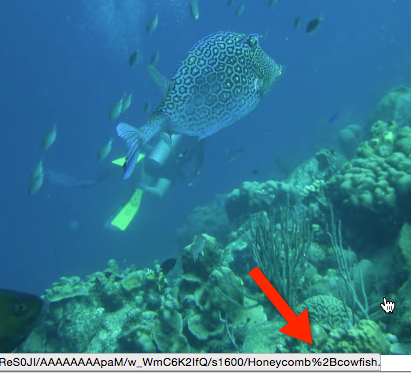 From FishBase: "Uncommon and wary" (wow, I guess it must have been quite a sight then). From Smithsonian Bocas Database: "Can darken, pale and change colours." Interestingly, the cowfish is considered an excellent food fish and is often marketed fresh, although I've never seen it on a restaurant menu anywhere in the Caribbean. There have also been reports of ciguatera poisoning from eating the cowfish. It is taken primarily in traps and occasionally with seines. This species is also a popular fish for display in public aquaria. I found it to be a relatively uncommon fish, not easily approached by divers. Ramón discovered that "The bodies of Boxfish [of which the cowfish is a type] are covered in a toxic mucus which can be released when stressed." Finally, my friend, the spotted moray. Luis: Gymnothorax moringa. From FishBase: "Usually seen with its head protruding from a hole and the rest of its body concealed" (just like the picture). "Observed to be unusually aggressive towards man ". "Its bite is very dangerous" (morays' teeth are really impressive). While Luis is correct (that's the entry in FishBase), I'll tell you from personal experience, that these eels are pretty shy and retiring. I got pretty close to take this photo. About 1 second after I shot this, the eel slithered back into the coral head and vanished. They're NOT particularly aggressive in my experience. Thanks to everyone who wrote in with answer and comments. I appreciate all of them! ... I'm actually on vacation this week. More on that later, but I'm trying to NOT spend much time online. For what it's worth, I'm completely failing at this. However, I thought I'd post a purely fun Search Challenge this week. It's not hard to figure out, but perhaps some energetic SearchResearchers will discover some fun facts about these IDs. This Challenge is purely for fun. Let us know what you find out! .. an SRS question about hills when I'm back in Bonaire, spending most of my free time underwater. As you probably remember from the parrotfish Challenge of 2 years ago, this is a fascinating place. Or this one... The key feature is that the hills repeat periodically. 1. Does the term "frequency" make sense when applied to repeating hills? 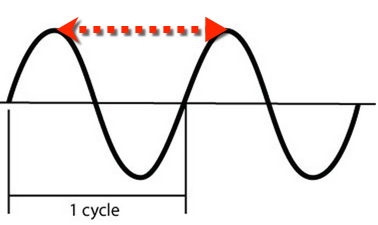 Frequency is usually defined as cycles / unit-time. Can you figure out how to apply the concept of "frequency" to hills? 2. What's the frequency (however you define it for hills) of this stretch of hills above? You'll have to find it, measure it, and then figure out the "frequency," if you can! Here's how I thought about the Challenges. 1. Frequency for repeating hills? 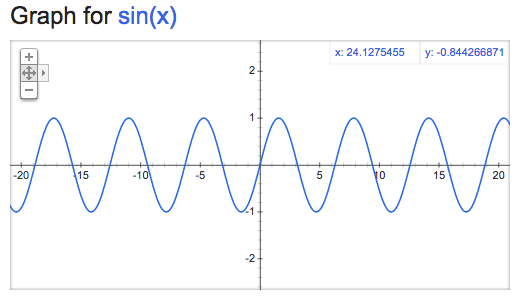 This Challenge came about when I thought about my travel uphill and downhill as though I were on a sine wave. When I wanted to write about the experience of running on the trails in the hills, I really wanted to say "the hills are high frequency hills." The idea being that they go up and down in rapid succession, just as a high frequency sound wave would. As several people noted, the idea of frequency generally involves a time basis. That is, frequency is usually expressed in "cycles per second." At the beginning of an orchestral concert, the concertmaster would often play the note of A, which has a frequency of 440 hertz (or cycles-per-second). But what about hills? More generally, what about space? Ah ha! So if we measure the peak-to-peak distance of the waves of the hills, we can figure out the "cycles / meter" to get the spatial frequency of those particular Pt. Reyes hills. So.. how do we do measure the peak-to-peak distance? You COULD get the "Terrain map" view (aka "topographic map" and just measure the elevation of the peaks and the valleys. But that's pretty slow. Could we find a better way? tells you that you can use Google Earth to draw a path anywhere on Earth, and ask for the "elevation profile." That's exactly what we want. 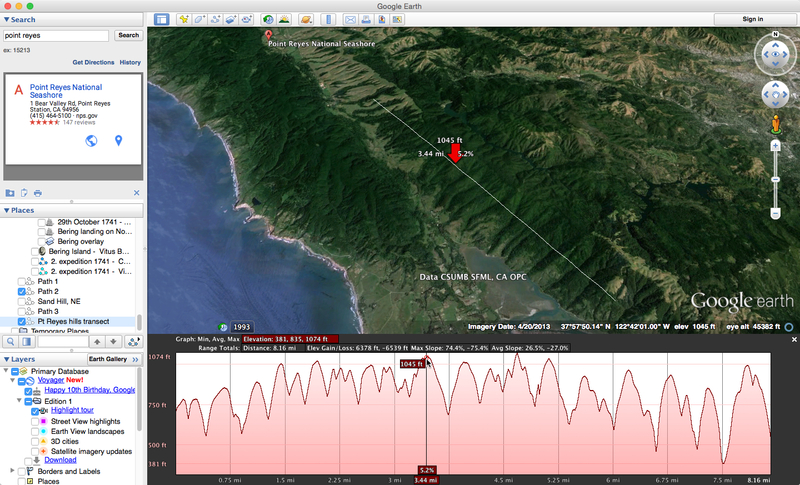 In Google Earth I fly to that part of the Bolinas Ridge, and draw a path, then ask for the elevation profile. 2. What's the frequency Kenneth? From this diagram, I just read off the first set of distances of the peaks from the origin. I dropped the numbers into a spreadsheet, then averaged the distances together (not a perfect solution, but good enough for this use case). 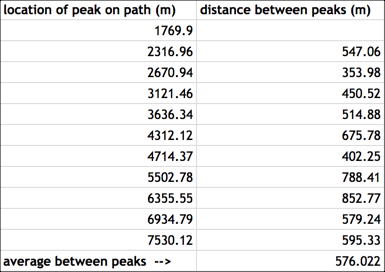 Since the definition of a cycle is the distance between peaks, we can see that the average distance between these regular hills is 576 meters. Suppose that the red line is 1 m long. These hills (well, speed bumps, more like) would be at 1 cycle/meter--or 1 cpm. If they're 2 meters apart, they'd be 0.5 cpm, and so on. Our Point Reyes hills are 576 meters apart, so that's 1/576th of a cycle per meter, or (using Google Calculator) 0.001736 cpm. 1. Looking for concepts you sometimes find you what you need... In the "spatial frequency" case, we found the idea we were looking for. In the process, we learned how to define cycles-per-meter, which is what we needed. In the week ahead... Search on! 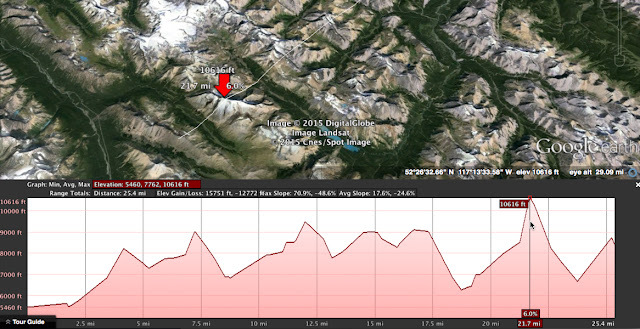 Search Challenge (9/16/15): How to describe the hills? ... and just a bit more down the path, I climbed another one just like it. A bit more down the path, ANOTHER one just like it. Interesting--how long would this repeated series of seemingly identical hills go on? As I flew across center part of the US yesterday, I had a window seat and able to peer out the window for much of the flight. What I saw amazed me, and it reminded me of that repeating hilly path. I kept seeing waves upon waves of stone and sand, patterns written in the geography. One of the problems we have as writers is knowing how to describe places in ways that are evocative AND descriptive enough that you get a great sense for what it's like to actually be there. I can tell you the path I was on was a jungle path, or a desert path.. but it's hard to be precise about the path per se. Tony Hillerman might write "...the eroded flanks of the hills covered with an infinity of dark green creosote bush and the grey-white desert grasses...", or Hemingway could say "... Hills terraced and yellow fruit shining through the green leaves and darker green of olive trees on the hills, and streams on the hills, and streams with wide dry pebbly beds cutting down to the sea and old stone houses, and everything all color." These are beautiful, but vague. Face it, I've got an engineering heart (wrapped in the pulsing body of a poet), so I'm looking for something a bit more.. precise. How far apart are those hills? How high and low do they go? Here's one of the sights I spied from my window seat (this is part of Point Reyes, CA, near Bolinas Lagoon). Note the repeated foldings of the hills. That's a lovely pattern--now, how can I describe it? As you can see, the streams are all parallel, telling us that the hills and valleys are all parallel as well--repeated ridges marching next to the San Andreas fault. 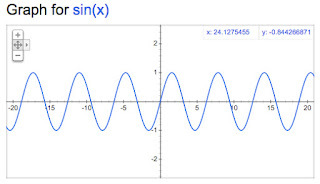 As you know, a wave like this can be neatly described by its frequency (how many up/down cycles happen per unit time, e.g., 440 cycles/second), and its amplitude (how for up and down the wave goes--in this case, the amplitude for the sine wave above is 1--it goes 1 unit up from the centerline). 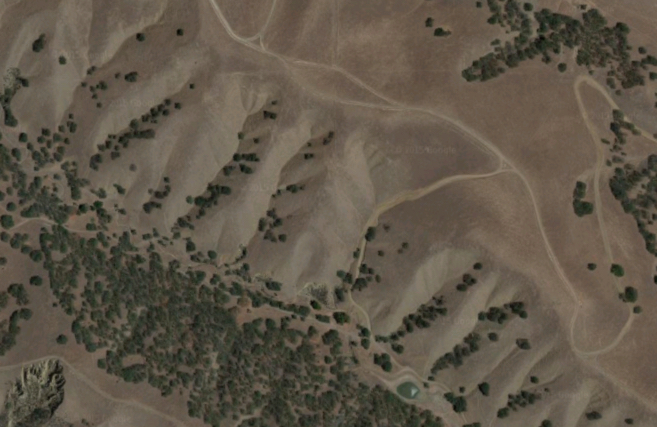 Now, if I want to describe these hills in Point Reyes, I thought about describing them in terms of their frequency. Some hills have a high frequency, while others have low frequency, but a high amplitude. With just a couple of searches, I was able to figure out the answer to today's Challenge. Can you? This Challenge comes in a couple of parts. Even if you can't figure out how to do parts 1 and 2, EVERYONE can do something on part 3. As always, be sure to tell us HOW you found the answer. P.S. I will be traveling again next week when the answer is supposed to come out. I might not be able to get to an internet connection to post my result. But stay tuned... you never know... I'll definitely post how I solved it. 1. Can you find more people like those above? They must be skilled in multiple arts / sciences / domains-of-expertise AND have left a record so we can tell what they were so good at doing. And just as importantly, HOW can you do a SearchReSearch strategy to identify these folks? In some ways, the trick here like one of those SAT questions that asks "What's in common between these people?" As the question says, they're all "... skilled in multiple arts / sciences / domains-of-expertise..."
As a SearchResearcher, I approach this question as one of finding the correct category or type. What do you call these people? More importantly, HOW would you figure out what these people are like? To start my search, I just did the obvious search for the core of the idea taken from my Challenge statement. 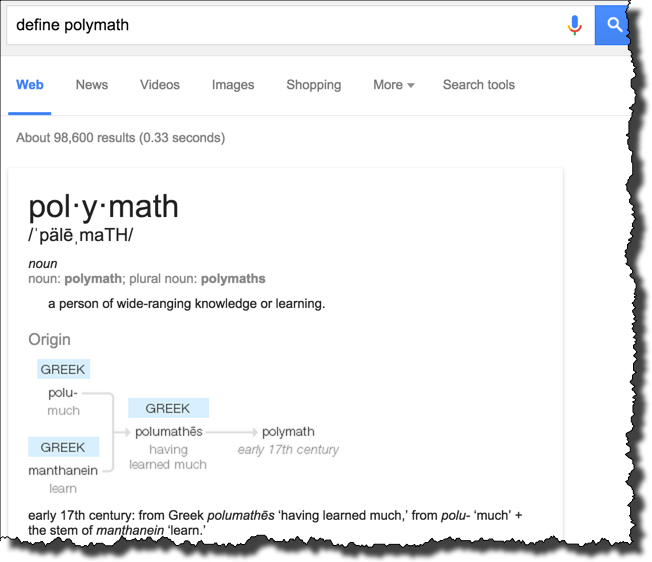 And I found a plausible word: polymath That sounds exactly right. But I wanted to try a different approach as well, just to be sure that I hadn't missed some other terminology. So I first looked for a Reverse Dictionary (remember this? we talked about Reverse Dictionaries before: they look up words when given terms from a definition). I like OneLook's Reverse Dictionary, so here's what you'll see there (given the same query)--several terms that look promising. 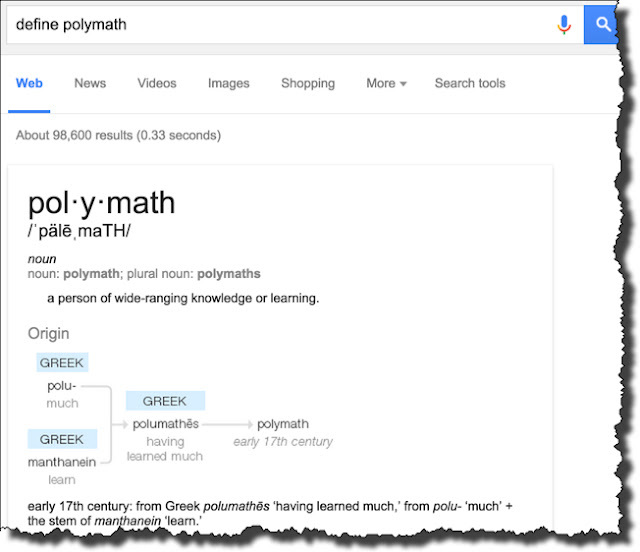 As you can see, polymath is there as well, but so are cambist, chaldean, and deipnosophist. (I looked up cambist and chaldean, and they're both off-topic.) But deipnosophist is fairly interesting. So I checked it out--could this be a possible word to use? That sounds pretty decent. But I thought I'd do a quick check, just to be sure I'm on target here. 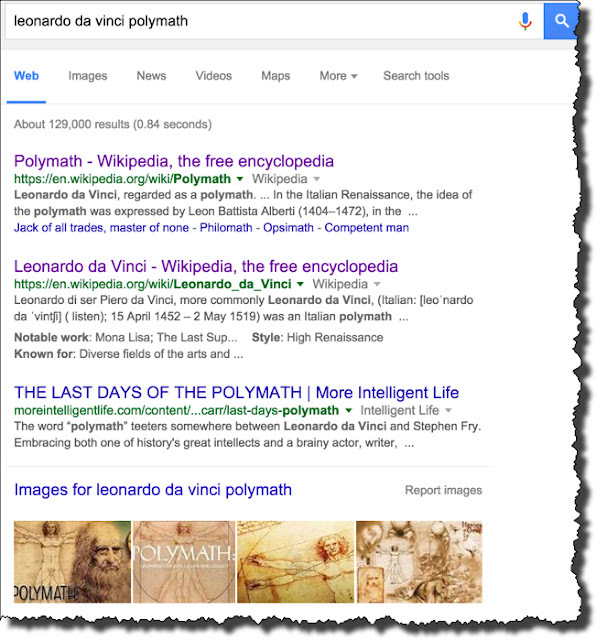 My query [ Leonardo da Vinci polymath ] is intended to check to see if other people describe him as a polymath. Answer: They sure do! There are even images of Leonardo, the polymath. Now I want to find a bunch more people like Leonardo (or Alberti, or Goethe, or....). Which gives me a great collection to choose from. A quick skim shows me Charles Babbage, Charles Darwin, Thomas Jefferson, Galileo, Benjamin Franklin, Isaac Newton, and my personal favorite, (this week at least) Joseph Priestley. Priestley was the18th-century English theologian, clergyman notable for his dissenting opinions, natural philosopher, chemist, educator, and Liberal political theorist who published over 150 works, many of which are significant. He is usually credited with the discovery of oxygen, but also gets my undying approval for having also invented soda water. He did it all--politics, theology, optics AND fizzy water for my afternoon repast. Oddly, I never knew (until I started writing this) that he lived the last 10 years of his life in Northumberland Pennsylvania (near Harrisburg). He turned down a faculty appointment at U. Penn, but he gave advice to Jefferson about how to set up a proper university (which Jefferson then used to establish the University of Virginia). 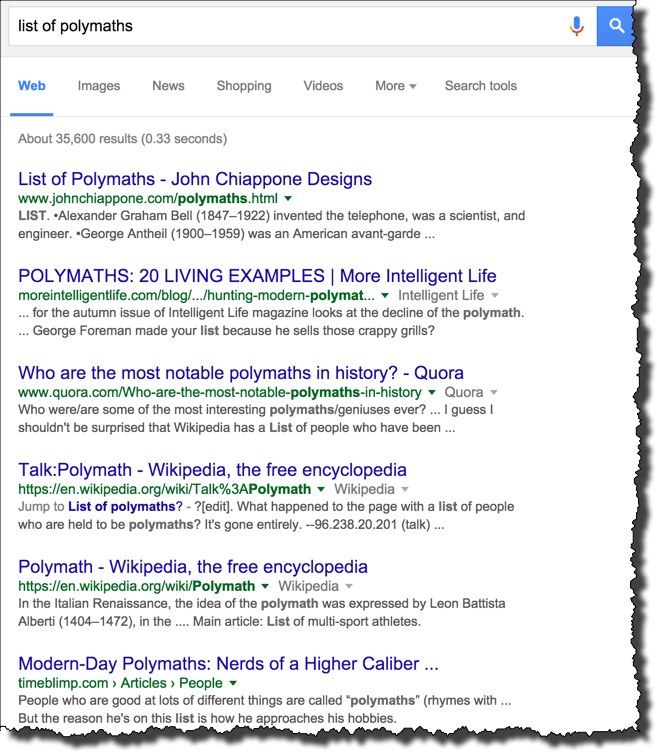 As I mentioned, there are many polymaths in the world, not necessarily dead, white, men. The [ list of ...] trick works again: [ list of female polymaths ] gives us several wonderful lists, including Hypatia, Trotula of Salerno, Hildegard of Bingen, and Maria Gaetana Agnesi. You can keep changing the modifiers to find more. I used [ list of African polymaths ] and [ list of Indian polymaths ] etc etc. A 16th century Ottoman polymath: Matrakçı Nasuh with a web page which includes the following surprising sentence: "...The most well-known episode of his engineering talent occurred during the circumcision ceremonies of Süleyman’s sons, Mehmed and Selim, when he famously constructed two moving citadels out of paper from which soldiers emerged and staged a battle, as part of the public spectacle and celebration in the Istanbul hippodrome (Yurdaydın, 144)." George Washington Carver: the African-American botanist and inventor. Cheikh Anta Diop: a Senegalese historian, anthropologist, physicist and politician. And Ibn al-Haytham (Alhazen): an Iraqi scientist, physicist, anatomist, physician, psychologist, astronomer, engineer, inventor, mathematician, ophthalmologist, philosopher, and theologian. All of these people are pretty amazing, and well worth the time to study. One common trait that's pretty obvious (in retrospect) is that they ALL wrote something that has survived the test of time. A lesson for me: Get busy and write that book! 1. Even vague ideas can be captured in a single word (or short phrase)--the problem is to find that term. In this case, a 2-step strategy was the right one. 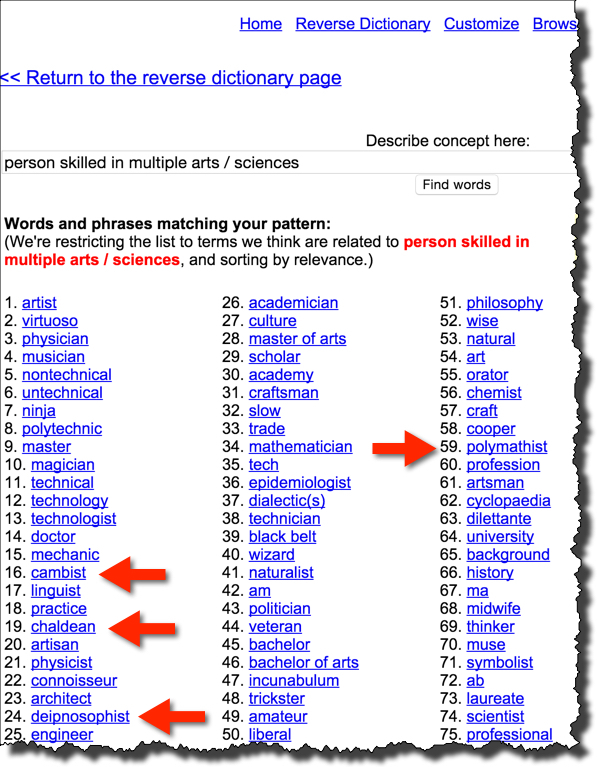 First, find the word (or phrase) by describing the concept--".. skilled in multiple arts / sciences / domains-of-expertise..." and then scanning for a short term that captures exactly that idea.